Nutri Women understands that the best approach to beautiful skin is to renew your skin from the inside. To look young you need to feel young – in mind and body. Nutri Women combines skin enriching antioxidants that renew your skin from deep inside the dermis, while powerful anti-ageing cosmeceutical creams protect and beautify your skin from the outside. By combing internal and external methods, you can enhance the effect of the product by at least 10 fold than when using a cream on its own. 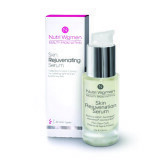 The Nutri Women range is natural, paraben and SLS free and not tested on animals.